Title: Why Not a Unicorn Also? Author’s Note: Not my characters, only my words. Written for jennytork as a pinch-hit for 2016 spn_bigpretzelspring fic exchange. Set in season 6 just after Sam’s soul has been restored. 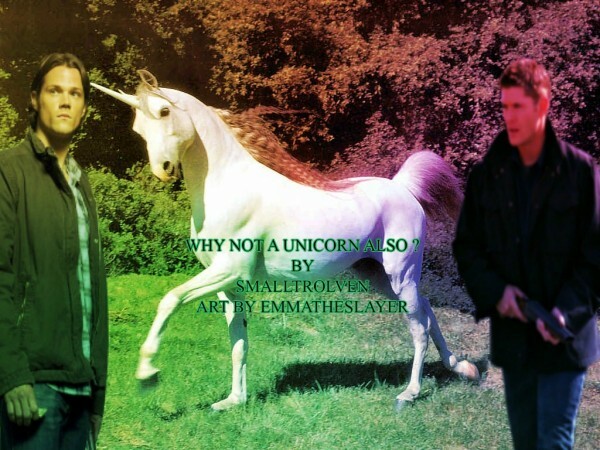 Thanks for the beautiful unicorn & brother art emmatheslayer! Summary: Just after they've successfully battled their first dragons, the brothers finally get to hunt an actual unicorn. “If you believe in me, I’ll believe in you,” said the unicorn. - Lewis Carroll, Through the Looking Glass. The forest ferns keep wrapping themselves around his feet as he pounds up another steep hill after the beast. He can hear his brother behind him, panting and swearing and stumbling too. They've been running for at least a half hour now, up and down hills, over one creek—twice, all through this dripping-wet forest. “Whose idea was this anyway?” Dean yells from somewhere off to the left behind him. The beast stops then, at the top of the hill, the last of the sun glinting off of its white hide. How can it possibly be so purely white like that, shouldn’t it be as green-stained and messed up as his pant-legs? It’s like it has teflon on the outside. Or maybe its just too pure for this world like some of the lore says. Sam stops for a moment, as he realizes that it is looking at him, straight in the eye. The weight of its gaze is heavy, assessing, Sam feels as though his soul is being weighed and valued. The beautiful hazel eyes watch him as he continues his hesitant approach. The noise of his brother behind him fades into unimportance as he gets closer to the animal. It stands so still, just there a few paces in front of him, as if it’s waiting for him to finally catch up. The single horn is incredibly sharp when viewed from this close. It gleams with an almost metallic sheen in the sun. There is a slight scent of vanilla or perhaps almond, and there is nothing horse-y at all about this creature except for the sharp hooves. It’s not even panting or winded, which means it led them here on purpose, it wasn’t being chased. Sam feels that as a certainty in his heart somewhere, ringing with the truth. Sam’s close enough to touch it now, and he can’t stop himself from reaching out one trembling hand to touch its utter perfection. It stands there, seeming to be waiting for the contact, as if the weight of his touch has always been expected, even welcomed. His hand seems so coarse and ugly as it nears the gleaming white mane. He makes contact with the soft furry base of one ear and he could swear the chuffing purr sound is a happy one. It leans its head into his hand and he automatically begins a gentle scratch. Dean pulls at his other arm then, he’s saying something, he sounds worried, but Sam doesn’t care—can’t care, because he’s touching the purest, gentlest being in the entire world. He and the unicorn fold their legs and settle down into the grass. It lays its large head carefully in his lap and Sam’s fingers dig deep into its glorious white mane. Dean is tugging on his arm and Sam tries to shrug him off to ignore him. Sam can’t speak, can’t break this moment of pure clarity. Because this is what his injured soul needs. Contact with something purely good to wash away all the angelic and demonic evil he’s been assaulted with. He can feel his soul soak up the goodness and light the unicorn is giving off the longer his hands stay in contact, the better he feels. All of those jagged edges that Death had pulled back around the Wall in his memories feel soothed, smoothed over with the balm of the unicorn’s presence. He feels Dean’s hand in his then and he brings it to touch the unicorn along with his own. Dean sinks to his knees beside him and Sam can feel his brother relax, leaning into his side. They both pet the unicorn for what seems like the longest golden hour of his life. He and Dean, the brothers who have been to Hell and Heaven for each other, soul-mates wound around so tightly together it’s pointless to separate any longer, their souls are re-unified in the presence of Creation’s most perfect being. Finally the unicorn seems to be done with being petted, it looks at Sam in the eye, the deep hazel depths sparkle with a fierce and wild joy. Sam’s soul thrills deep down inside at the knowledge that this creature of perfection allowed him to touch, to have this, and to share it with his brother. He murmurs his thanks out loud and in his mind, hoping the creature can understand. The unicorn nods and rises, regal and terrifying in its height above the still seated brothers. The point of the horn lowers until it touches the crown of Sam’s head. He’s not scared, although he probably should be, he can feel his brother tense beside him going into automatic protective mode. The unicorn purr-rumbles at him and Sam falls backwards into the grass, his mind overcome with all that the beast gave him with that one touch of its horn. He hears the hooves clip clop off until they’re indistinguishable from the background forest noise. Dean blocks out the sunlight as he leans over, assessing his state. “Sammy, you okay?” Dean asks, worried and tense. “Yeah, definitely,” Sam answers, feeling a flush of shame at the memory of their intention at the beginning of this hunt. “Why’d it let you pet it? Thought that was only virgins that could do that?” Dean asks. “Guess I’ve been, what was it you called it? Yeah, re-hymenated,” Sam says, chuckling to himself. Dean laughs out loud, sparkling and clear with sudden joy, his shaking shoulder vibrating against Sam’s, transferring the happiness. Then its Sam’s turn to laugh, because of course, unicorn soul-calamine was exactly what he needed, and leave it to Dean to figure out how to make it happen. This was so perfect! I'm in tears! Thank you!!! Thank you both!! You're so very welcome! It was fun coming up with something involving a unicorn, thanks for the prompt. And sorry for posting a couple days late too! No worries-- it was worth the wait!! They need something like this, right? Thanks so much.